Our 1x30 leather strop honing belt is manufactured with the highest standards in the sharpening business. It will remove minor scratching, polish, and keep the edge sharp longer. Just like the old Barber's Razor Strop, maintain a professional quality edge Fits any Belt Sander that takes 1x30 Belts. The leather belt is manufactured just slightly less than the 30" to allow for stretching. When you first put the knife stropping belt on your sander, it will be very snug. Make sure to take the belt off when not in use as you don't want it to stretch too much. All of our 1x30 leather belts are made by hand in the USA. We do not cut any corners to make sure that your tool and knife sharpening experience goes smoothly with our pro and diy products. Use the included buffing compound to put a mirror finish on your knife or tool. Many knife makers and sharpeners use the leather honing belt to maintain knives as well. By regularly honing your Knife on leather, you can avoid more time consuming sharpening that requires removing metal and then refining the sharp edge. The leather strops and belts perform best when a knife edge has already been brought to a sharp point. Then it is used as the final refinement to get shaving sharp and be able to shave hair on your arm. The rotation on the belt can go either way so you don't have to look for directional arrows and worry about that. The Harbor Freight 1x30 belt sander can be adjusted to allow for slight variances in the lengths of the leather honing belts. You can count on Pro Sharpening Supplies and Texas Sharpening to provide a high quality product at a very competitive rate. We guarantee our 1x30 Leather Honing Belt against and defects. 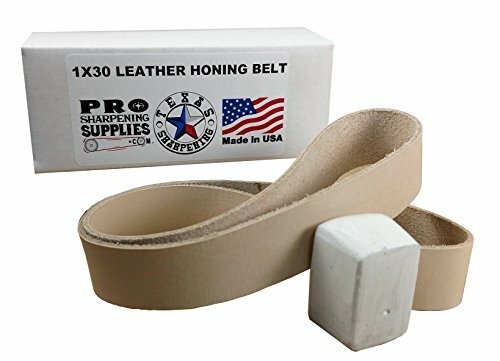 1" X 30" Leather Honing Strop Belt for 1x30 Belt Sanders. Give Every Tool in Your Shop a Scary Sharp, Professionally Polished Edge. This Leather Strop is made slightly short to compensate for stretching over time, extending the life of the belt. The initial installation may require stretching of the Leather Belt. If you believe your leather belt is too short, Don't hesitate to Contact US! High Quality Shoulder Leather, Strong Seam Guaranteed Not to Break. If Your Leather Belt Fails for Any Reason, Contact Us and We'll Replace it. A Leather strop is a flexible strip of leather used to straighten and polish the blade of a knife, woodworking tool like a chisel, or a straight razor. 1-2 oz. White Diamond Buffing Compound Included Estimated Grit of 10,000 with Aluminum Oxide Abrasive. The White Cutting Compound is perfect for sharpening. Get a Beautifully Polished Edge That Will Stay Sharper Longer. If you have any questions about this product by Pro Sharpening Supplies, contact us by completing and submitting the form below. If you are looking for a specif part number, please include it with your message.